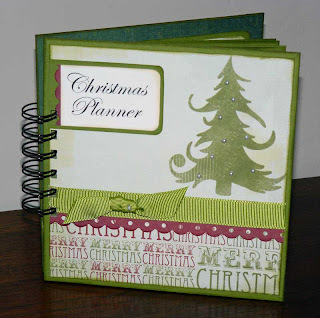 Christmas Planner | Make a plan ... to get ready for Christmas! Looking over our site, do you have the idea that over-the-top embellishments are standard fare for a handmade holiday planner? For a different idea, take a look at this simple handmade holiday planner. Shared online by Scribd user Menucca, it's a 10-page, hand-drawn set of holiday planning pages. Uploaded in December, 2009, Menucca's calendar is for a previous year--but what does it matter when her pages are so fresh and creative and fun? Want a great way to kickstart planning for Christmas, 2010? 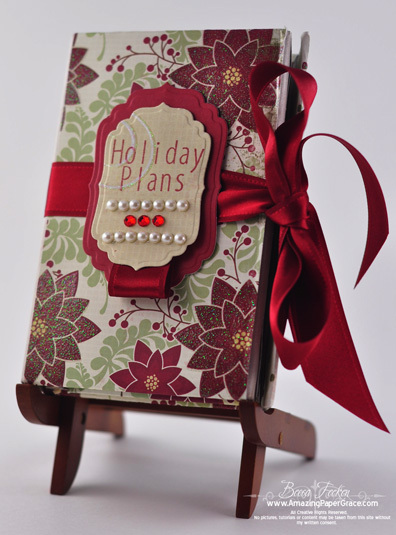 Check out this handmade holiday planner from Becca at Amazing Paper Grace blog. Looking at this lovely project made me itching to get out my Spellbinders dies and play! The cover ornaments, shaped and embossed, give a classic touch to this project. Lush ribbon closures and a stamped title make this an elegant holiday planner that would be a joy to use. Inside the planner, don't miss three notebooks for list-making. Becca's made her own notebooks and list pad; if you're not-so-crafty, adding a cover to a repurposed notebook would shortcut the project. Sure, you can start with a pre-made notebook or composition book to create a Christmas planner--but making your own from scratch is easy, with this pretty tutorial from the Postcards from the Attic blog. Sized at 6.25 inches square, this pocket-based planner is easy to assemble using a hole punch and O-ring binding.. With a subtle and pretty color scheme, rubber stampers will appreciate the easy-to-add stamping embellishments that make this project special. Not to late to make this special holiday gift! Ready to try your hand at an accordion pocket planner? At blog They Call Me Jammi, you'll find a lively example and video tutorial for this Christmas planner project. While similar to a Christmas pocket planner, an accordion pocket planner sandwiches more than one set of file folder pockets into the planner cover. The expanded storage space offers more room and versatility for planner calendars, lists and planning pages. Simple, sweet and oh, so organized! Thanksgiving Day is on the way ... will you be ready? Find a pretty bit of planning help with this free printable Thanksgiving planner from Web site Whaddya Lookin' At? With menu planner and shopping lists, recipe cards and seating chart, these printable pages would be a nice addition to the Christmas planner or household notebook. Creativity has taken a simple stack of paper sacks to a pearl of an organizer: meet Queen Cat's Christmas planner! Posting from stamping blog Queen Kat's Stamping Castle, this talented stamper began with a base of everyday lunch sacks, then punched, stamped and embellished her way to a useful--and gorgeous--holiday organizer. I think she must have had a LOT of fun creating this planner, judging from the many different stamping techniques, products and embellishments used to create it.